When it comes to the fundamentals, consistency is paramount. If you can repeat the same positions, moves, and methods over and over, you'll simplify your technique and ingrain the correct habits. That's one of the reasons why I maintain one ball position for all shots. 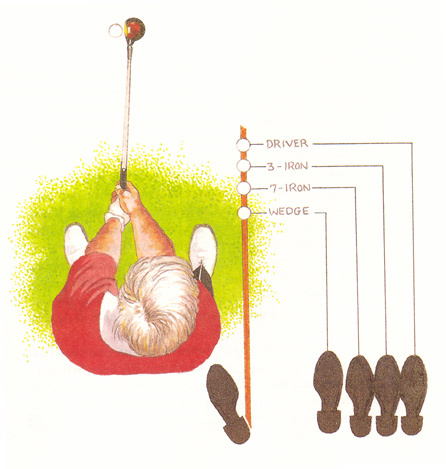 Then, to make the setup comfortable and the stance stable, I move my right foot closer to my left as the loft of the club increases. I realize that many instructors advocate that you move the ball progressively back in the stance as your club shortens. But when you do that, you're changing the loft on the clubs - if you play the 6-iron a bit farther back than the 5-iron, then you're delofting that 6-iron so that it's effectively a short 5-iron. You're also changing the point at which your swing makes contact with the ball. I have enough trouble maintaining one impact point - I don't want to have to deal with a dozen of them. Unless I'm trying to play a special shot of some sort, I position the ball at a point just back of my left heel. Your own position may be a bit farther forward or back, but I encourage you to determine exactly where it is, and then stick with it for every club in your bag.